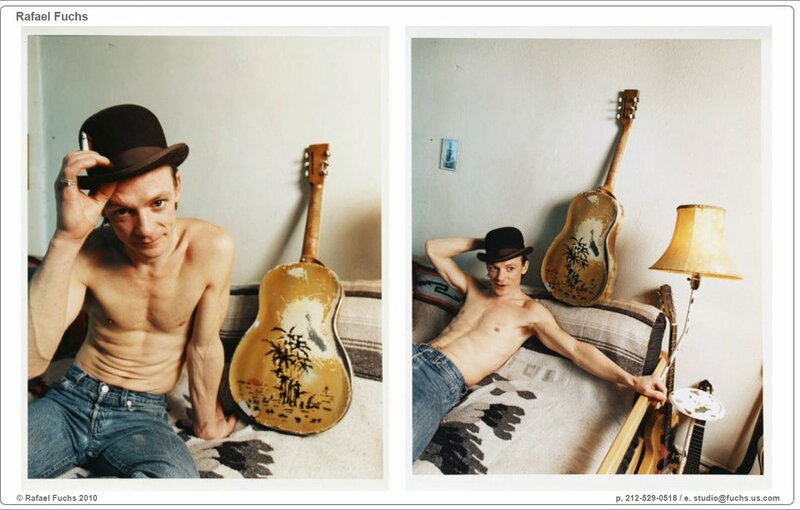 For Chris Whitley fans, his seen-better-days National Triolian is the stuff of legends, an icon that immediately elicits images and sounds from Chris’ musical career. A handful of fans even have personal memories of this icon; alas, I am not one of these lucky few, but I’ve been blessed by their sharing those stories. On the National website . 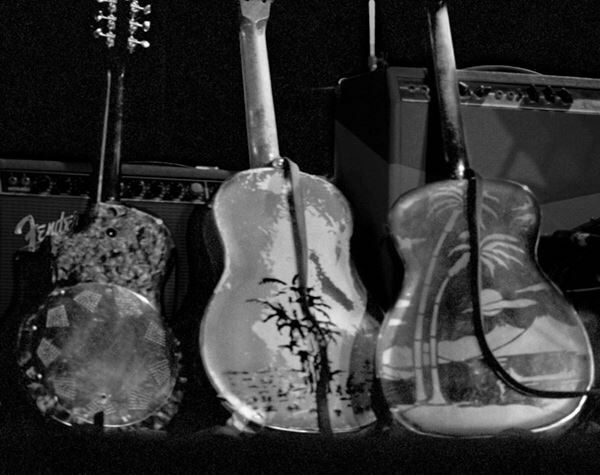 Resonate: A guitar story , a documentary about resonator guitars. Suffice it to say that the first National guitars were designed to amplify sound in much the same way that Thomas Edison accomplished this feat when he invented the no-electricity phonograph. The History and Artistry of National Resonator Instruments notes that “The principle component of these early non-electric phonographs was a pickup head that transmitted sound from the stylus to a small mica disc. The disc acted like a banjo skin or the paper in a kazoo. It amplified the sound.” The National website has some fascinating photos of the insides that perform this amplification trick; it’s all about the cones: how many?, how mounted?, etc. Also peculiar to resonator guitars is their dynamic range: the difference between the quietest and the loudest sound an instrument can make. 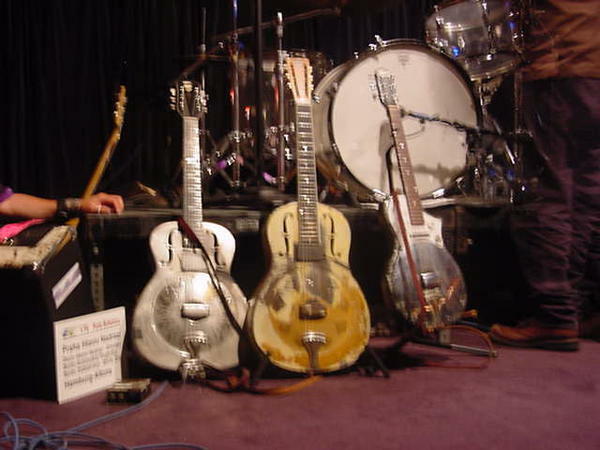 Unlike electric guitars, resonators allow the player to attack the strings in different ways, thereby producing different levels of amplitude. The Triolians, of which Mustard is an example, are single-cone guitars with a polychrome yellow/pea green finish and the prettiest back-side I’ve ever seen! As shown in the photo on the left, Nationals feature sand-blasted, typically Hawaiian scenes on the rear of their metal bodies. The next photo provides a wonderful view of Mustard’s back-side (Chris doesn’t look bad either!). The big heavy strings on his guitars came later on as the tunings got dropped to accommodate the lowered range of his voice. For example, Phone Call from Leavenworth was originally in the key of A, but by 2004 he was playing it in F# with the guitars’ tuning lowered a tone and a half. When I first met him in 1993, his Nationals were strung with electric guitar strings that were very thin for these instruments. If you lower the pitch like he was doing years later, the string tension would make them feel like rubber bands unless you increase the string thickness accordingly. Sometime in 2002 – 2003, Chris damaged Mustard. Dan Whitley recalls that Chris “smashed it against the wall and broke the neck off it. [He] had the neck and body put back together with a new fretboard [work performed by a master luthier in NYC] so it was as good if not better than before. It stays in tune better and seems more stable.” Patterson noticed that, when he saw Chris in 2004 – 2005, “he didn’t have Mustard with him. I joked that he had found another girl (the Style O) that he loved more than his ‘true love’. And he just rubbed his hands over his face and said, ‘She’s at home, truly fucked!’ When I saw him last, which was four or five months before he passed, he was still playing the Style O instead of Mustard.” Brother Dan offers this insight regarding why Chris adopted the Style O as his main guitar: “Chris stopped touring with Mustard for two reasons: #1 He wanted to keep it safe from himself (LOL), but also #2 he liked the warmth of the brass bodies plugged in better for what he was doing — mellower, jazzier, warmer vibes. He told me ‘the 29’s steel body sounds like a chainsaw plugged in.’ And I replied, ‘Sounds perfect for me!’ ” So, during a difficult time and in need of cash to buy a plane ticket to Germany, Chris sold Mustard to Dan, albeit with Dan’s proviso that it would always be Chris’ guitar and that Chris should use it whenever he wanted. Patterson sums up just how iconic Mustard has become: “[I]t’s a guitar that’s so synonymous with Chris. A lot of people these days see a yellow polychrome National Triolian, and they say, ‘Hey, that’s a Chris Whitley guitar.’ ” And Dan adds, “I’ve known and played this guitar since Chris first got it, and he wanted me to have it; he knew how much I dug it all those years. 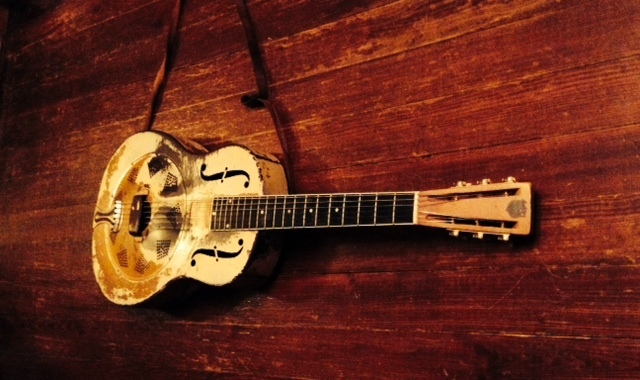 That guitar has all kinds of unbelievable history and mojo. It has years of my brother’s sweat and blood ingrained in its thin steel body and neck; his molecules are embedded in it. It still smells like Chris just took it off and handed it to me, and I want it to stay that way.” Mustard now resides with Dan, who cherishes it as “something sacred” and who provided the following photo. Somewhat related, I was a fan of Chris’ from Living With the Law and in fact, his CDs (along with my extensive Jeff Buckley collection) make up most of the CDs I still own; having long since sold of my 500+ CD collection. I was crate digging a few years back and was delighted to come across a “Promo only – Not for sale” version of Chris’ “National Steel Edition” record on vinyl which of course features his Triolian on the black and white album cover. Thanks for posting this. I have been listening to a lot of Chris this past month for some reason. Din of Ecstasy on repeat.